Physiotherapy plays an important part in the treatment of limb reconstruction, and daily exercises are essential to help rebuild mobility and strength in your limb. Our physiotherapist will tailor a programme of physiotherapy and an exercise regime to suit your specific individual needs. Physiotherapy plays an important role throughout limb reconstruction treatment. Your physiotherapist will guide you through the process and you must make sure you complete your physiotherapy each day. You will have times when you find it difficult to stay motivated. Speak to your physiotherapist about this as regularly changing your exercises to maintain some variety can be helpful. You can also complete your physiotherapy in different environments – at home, in the gym or at the hydrotherapy pool. Patients are only allowed in the hydro pool if their pin sites are not weeping or infected: you consultant will advise you whether or not you can exercise in the water. Involving your family and friends can also provide you with support. You can read more about physiotherapy on the website of The Chartered Society of Physiotherapy. You will see a physiotherapist initially whilst you are in hospital, and will then be referred to your local hospital to continue physiotherapy as an out-patient. You will continue physiotherapy after your frame has been removed, to make sure you recover and achieve your full potential. Physiotherapy can help prevent a number of common problems that can occur in patients undergoing limb reconstruction. Your physiotherapist will assess your joints. muscles and tendons and show you exercises designed to work on any problems they observe. These exercises may aim to increase the strength in weak muscles, stretch tight muscles and tendons, or move joints through their full range of movement. Patients with a lower leg frame tend to have specific problems with their foot, so this may be an area on which you need to concentrate. You may have to wear splints to keep you arm or leg in a good position while you are resting. You will also be advised how to rest, for example keeping your arm or leg elevated to control swelling. Swelling can also be managed by massage which your physiotherapist can teach you. Once your consultant is happy for you to do so, taking weight through your arm or leg is very important. It stretches muscles and tendons and stimulates healing. Patients with a leg frame often find this difficult and tend to walk with a limp. 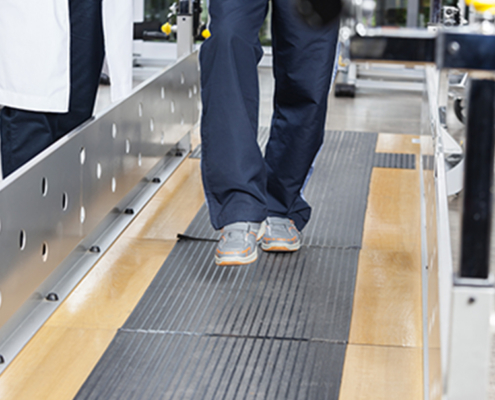 Your physiotherapist will works with you to improve your mobility and to make sure you have a good walking pattern. A limb reconstruction frame can affect your balance reactions, also known as proprioception. This is another area of rehabilitation that you will have to work on and your physiotherapist will give you exercises to do at home. Throughout the limb reconstruction process you should use your arm or leg as normally as possible, and your physiotherapist will advise you on how you can be as independent as possible. One of the first things Rebuild did was to ask our patients how we could help more. Many people said that they needed better access to physiotherapy. We consequently raised the funds and developed our own specialist physiotherapy service as part of the clinics. Part of our physiotherapist’s role is to educate other physiotherapists to work in the fairly specialist field of limb reconstruction. Help sheets giving physiotherapy advice for patients and physiotherapists, for downloading or printing. A help sheet giving essential physiotherapy advice for patients, such as how to relieve muscle tightness, joint stiffness, swelling and a host of other suggestions and recommendations for patients. For patients at KCH, you will also find contact details for the senior physiotherapist in limb reconstruction, as well as the clinical nurse specialists.